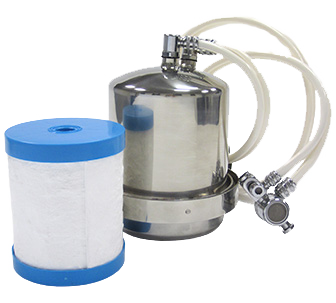 Multipure’s Aquamini provides powerful filtration in a compact size. This convenient countertop drinking water system connects quickly and easily to most existing faucets, allowing it to be set up and removed from location to location within minutes. Despite its compact size, the Aquamini utilizes the same formula as Multipure’s renowned CB6 filter, the same formula that offers the Aquadome and Aquaversa their superior performance. The Aquamini is the perfect portable filtration solution for travelers, vacationers, and students.